The 2014 LERN Annual Conference brochure is on the way! 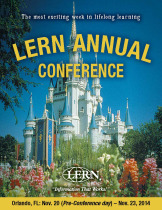 The 2014 LERN Annual Conference is headed to Orlando and your brochure is on the way! It's the most exciting week of the year in lifelong learning and you won't want to miss it. Pre-conference sessions start on Thursday, Nov. 20, and the full conference runs Nov. 21 through Nov. 23 at the Walt Disney World Dolphin. Why attend the LERN Conference? The LERN Annual Conference is North America's premier conference for lifelong learning. This is your best chance to network with other professionals in your industry. The LERN Annual Conference has information not available anywhere else, including ratios for success, hard data that will help you boost registrations and figures to help you increase income. Only the LERN Annual Conference offers such a substantial ROI. You will generate 10-times more money than the cost of the conference. The LERN Annual Conference has the best experts in lifelong learning and continuing education on everything from finances and marketing to operations and instruction. Register by Aug. 1, 2014, and take advantage of our early registration discount. Save big by bringing a third person from your program at no cost at the basic registration rate.